President Barack Obama is set to visit his father’s native Kenya this weekend in a long-anticipated trip designed to highlight his personal ties to a continent that has largely been on the periphery of his foreign-policy agenda. Mr. Obama plans to showcase initiatives he hopes will define his Africa legacy, such as steps to increase access to electricity. He will move on to Ethiopia, meeting with the African Union on matters of trade, business and security, as U.S. officials have voiced growing concerns over the rise of extremism. But his arrival in Nairobi on Friday is in itself a hallmark moment for his presidency. For Mr. Obama, it isn’t so much what he does, but who he is that ties him to the continent—and to Kenya in particular—and sets him apart from other U.S. presidents who have invested resources in Africa. His two-day visit is widely seen as a homecoming of sorts, as the first African-American U.S. president returning to a country that considers him a native son. Mr. Obama plans to spend time with members of his father’s family. He will meet with Kenyan President Uhuru Kenyatta, hold an event with young African leaders and reflect on his familial roots in a speech at an indoor sports arena. “He’s looking forward to the trip and the opportunity to spend some time in private with some of his relatives,” said Susan Rice, Mr. Obama’s national-security adviser. 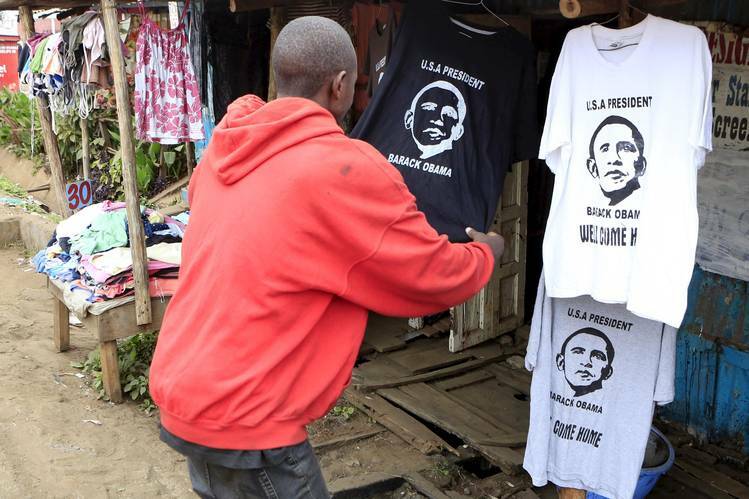 A customer looked at a T-shirt displaying the image of President Barack Obama at a stall in Nairobi’s Kibera slum on Thursday, a day before the president’s scheduled arrival in Kenya. Mr. Obama’s election in 2008 raised expectations across Africa for deeper American engagement. But his foreign-policy agenda has largely been consumed by unrest in the Middle East and efforts to strengthen U.S. ties in Asia. Former President George W. Bush was heralded for his efforts to combat the spread of HIV and AIDS in Africa, and his predecessor,Bill Clinton, spearheaded a host of economic initiatives on the continent. Mr. Obama, however, hasn’t showcased Africa initiatives until more recently, after his 2012 re-election, in part because of the political backlash stirred by his Kenyan roots. During his first term, Mr. Obama spent about a day in sub-Saharan Africa, with a brief visit to Ghana. His trip this week is part of a renewed focus on the continent in the homestretch of his presidency. It follows his gathering of African leaders in Washington last year, and his 2013 trip to Senegal, South Africa and Tanzania. Entrepreneurs are betting on an Obama bonanza when the U.S. president makes his first trip to Kenya as commander-in-chief. In the village of Kogelo, where Mr. Obama’s father was born, close and distant relatives are cashing in on the family name. Photo: Nichole Sobecki for The Wall Street Journal. Mr. Obama is expected to use the platforms in Kenya and Ethiopia to highlight programs to combat hunger and his 2013 electricity initiative, Power Africa, which has been slow to expand. White House officials said he also plans to raise human rights, corruption and democracy concerns. During a news conference last week, he described such governance issues in Kenya as having “held back this incredibly gifted and blessed country. Indeed, Mr. Kenyatta had until last December faced charges of crimes against humanity by the International Criminal Court. The prosecutor withdrew the charges. In Ethiopia, Prime Minister Hailemariam Desalegn’s ruling party won all seats in Parliament this year, a result the White House has said raises concerns about the integrity of that election. Africa is also increasingly a security concern for the U.S., with the rise of al Qaeda-affiliated terrorist groups in the east and Islamic State’s expansion in the west and north. “Counterterrorism will certainly be a focus,” Ms. Rice said. Kenyan officials have said they hope Mr. Obama will focus on how Kenya and the U.S. can collaborate on business—both bringing in large U.S. companies and helping nurture Kenya as a location for film production. But much of the two countries’ collaboration currently is in the realm of security—the U.S. trains Kenyan soldiers and shares intelligence in the effort to keep extremist militants from al Qaeda-linked al-Shabaab at bay. 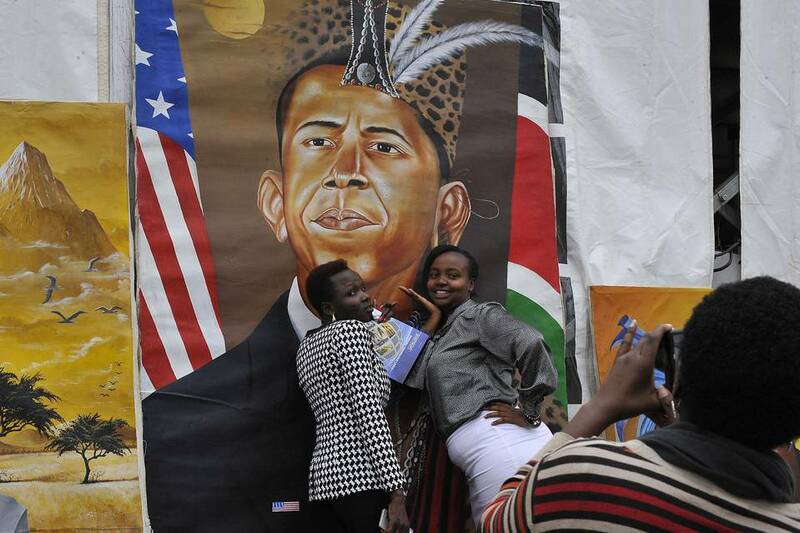 Mr. Obama’s 49-year-old half-uncle, Said Obama, said his nephew’s visit to Kenya has been eagerly awaited. “There’s huge excitement in Kenya and perhaps excessive expectations of what this trip might deliver,” said Jennifer Cooke, director of the Africa program at the Center for Strategic and International Studies. Unlike Mr. Obama’s previous trips to Kenya—he most recently visited as a senator in 2006—, this one is constrained by the trappings of the presidency. He won’t travel to Kogelo, the rural village about six hours outside of Nairobi where his father was born and where some of his family still lives. Instead, his relatives will travel to see him, attending his public events in the Kenyan capital and a state dinner hosted by Mr. Kenyatta. White House officials said security and logistical concerns required the president to remain in Nairobi. For Mr. Obama, that somewhat diminishes the personal resonance of the experience.